It would be our pleasure to learn about you, and see if this is a good fit for your time and skills. 1. Email us your LinkedIn profile and include the title of this volunteer opportunity in the subject line, and we will reply to you as soon as we can for further discussion. 2. Sign-up now as a Bpeace Skillanthropist, paste in the url of this volunteer opportunity, and within 2 business days you will hear from us to arrange a phone conversation to discuss this opportunity with you. Before this business can grow, and create more jobs for Salvadorans, they first need to address process improvement. The father and son team initially focused on printing services and their innovation and persistence helped grow the business. 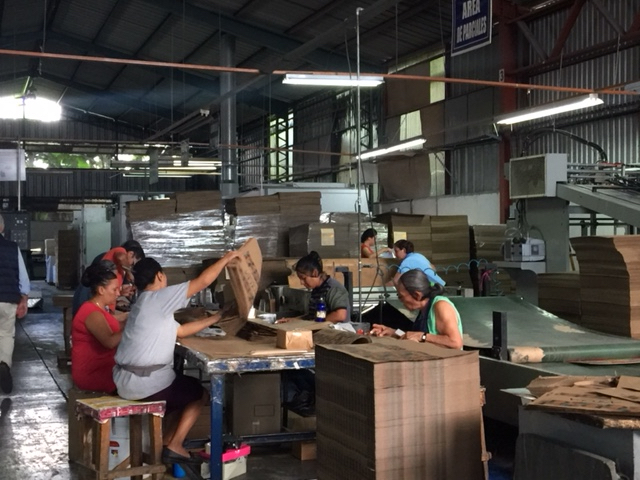 Twenty years later they have expanded into corrugated box production and employ more than 240 Salvadorans. The team recognizes that process improvement opportunities will enhance operational efficiency and that they need lower operating expenses before pursuing expansion. They operate in a competitive market that is subject to increases in paper prices. Improving efficiency is paramount to maintaining the jobs they currently provide. Helping the company grow will create new job opportunities throughout the Central American region. You will use your process improvement experience to reduce operating expenses, eliminate waste and establish operational efficiency. The impact of your work will identify revenue-generating expansion opportunities. Your knowledge and skills will help this dynamic team accelerate growth and create jobs that provide dignity as well as economic stability as a powerful alternative to violence. Provide approximately 12 days of consulting advice both remotely and in person. Subsequently travel to El Salvador for several days to work with the leadership team. More jobs are critical in El Salvador right now to help stem the flow of irregular migration. Small and medium businesses account for 60% of the economy. Steady employment provides legitimate alternatives for Salvadorans who would otherwise migrate, or pursue illegal activities and gangs. Your advice and expertise will help these businesses create jobs and build a stable future for their workers and communities. What you will be doing A family-owned corrugated and printed box manufacturer needs to improve profitability by reducing expenses and eliminating waste. Can apply your extensive knowledge of process improvement in the printing and/or packaging industry. Possess prior experience in lowering cost, reducing waste, and enhancing operational efficiency. Can volunteer approximately 12 days in 2019 to be a remote and in-person business advisor. Have international experience in business expansion and working with multinational companies. Harbor a passion for business, creating jobs in economically fragile El Salvador. How much will it cost you? Tax-deductible membership contribution to Bpeace (starting at $10 a month). Some travel costs (Bpeace pays for your airfare and hotel). 1. Copy the url at the top of this page for this volunteer opportunity. 2. Sign-up as a Bpeace member and paste the url of this volunteer opportunity.